The rent is still too damn high and only getting higher. Renters can be kicked out of their homes for literally no reason at all. Profit is the law of the developers and most of the landlords. If you do not own property, you are considered a second-class citizen when it comes to housing stability. And if you do “own” your home, but are still paying off your mortgage, you are likely one job-loss, medical emergency or economic downturn away from losing it to the biggest landlords of them all: the banks. 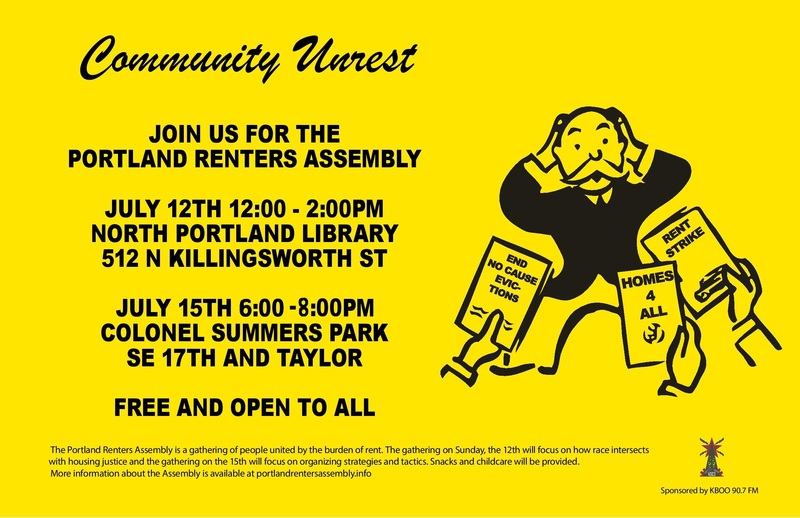 The Portland Renters Assembly is a gathering for the houseless, the “just-a-renter”s, and precarious working-class home-owners. Anyone committed to housing as a human right is welcome.There will be speakers on organizing for housing justice, a chance to tell personal stories, small- and large-group discussion about political strategy and lines of action. Snacks and child-care will be provided (RSVP if you need childcare). Portland developers scramble to build condos and apartments in every nook and cranny of the city. Paired with the reality of No Cause evictions in Oregon, this means our residents are being evicted with huge developments going in their place. Profit over powering people and in the process people are being pushed out of places they call home. More houses are being built and portlanders are paying the costs through their rising rents. At the last Assembly in July in Colonel Summners park, one resident spoke of spending 90% of their income on rent and utilities. Rents in Portland are reported to have grown 7%, at twice the national rate, with a median units costing $1,587 a month. And we are reminded 7% is an average after hearing one portlander share her story of a 20% increase, while another spoke of their rent doubling in four years while their salary remained stagnant. Another common thread running through the Assemblies is the desire for action. We in Portland are sick of profits coming before people, and are ready to stand up and demand, “You can’t take my home!” The Portland Renter’s Assemblies have shown that the housing situation in this city can not continue in the direction it is headed. The rising cost of housing in Portland ensures that many of our citizens live without certainty regarding how long they might live in their home. The toll of involuntary displacement is a burden no one should have to bear. And Portland’s culture matters and part of that culture is us, the citizens. No one who treasures Portland’s beauty should be driven out of our town. Which is why we are calling all Renters, Houseless people, and Homeowners, who are often renting from the banks, to join us in marching to support Housing For All. We will be meeting at City Hall Friday August 28th at 6pm. Bring your bodies, bring your banners because together we can create housing for the people. There was an excellent article about the Renters Assemblies in the Portland Tribune today. Max Denning was the reporter. CLICK HERE to hear Portland Renters Assembly organizers, Mara Zusman and Tori Abernathy, along with Black Live Matter activist, Jamondria Harris, on Positively Revolting talk-radio for July 10th 2015. MOVING IS STRESSFUL: Searching for a house, coming up with the extra cash for deposits, cleaning, packing, unpacking. Moving after an eviction, though, can be devastating. Oregon law dictates landlords only need to give either one or two months’ notice if they want you out, depending on how long you’ve been a tenant—but they don’t need to reveal their motives. Landlords are also allowed to raise rents however much they want, effectively evicting people who can’t afford the new price. There’s no agency tracking how often these actions occur, but they’re playing out a lot in Portland. The city’s tenants are starting to get angry, so they’re doing what Portlanders do: organize. The Portland Renters Assembly is holding meetings where renters can “tell their stories of abuse, exploitation, and displacement at the hands of landlords,” and several Facebook groups have popped up in which angry tenants are looking for solutions. Read the rest here. Thanks to Shelby King for writing it. The rent is too damn high. Landlords have the mostly unchecked power to kick us out of our homes for no reason at all. People of color still face discrimination when looking for housing on top of being displaced by market forces. Renters and allies in the struggle for housing as a human right, it’s time to put our heads together and build solidarity! It’s time for another installment of the Portland Renters Assembly. Join us for one or both assemblies. There will be speakers on race and gentrification at the first, and organizing across the community at the second. Individuals will be able to tell their stories of abuse, exploitation, and displacement at the hands of landlords, developers and the housing market. There will also be hope, and to that end time for group discussion about organizing for power in our communities, building tenant unions, housing as a human right, and more. Snacks and on-site childcare will be provided. This is a KBOO-sponsored event! Please invite all your Portland friends.